In a book I read a long time ago, the author spoke of history as if it were a clothe woven from many fabrics. I think now of this book. The title eludes me, but I remember that there were oil stains on it, that it had had seven previous owners and that their seven different names were written on its first page in ink of different colors, that its 234th page was torn, and that as a result I had ended my reading there. I pick up history again like an unfinished cloth. 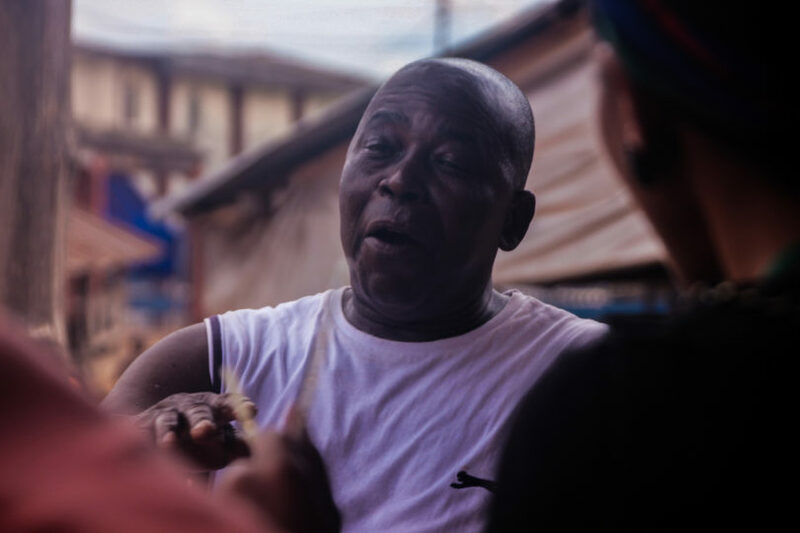 On the Benin-Abraka road, the eldest of three men tells a story of how his father, Ota Okuna, founded the little Ijaw community at the Ikpe Waterside. I try to pay attention. I notice instead his gestures, the interjections of the other men, their nods and laughter. I notice how they punctuate the man’s story with theirs when his memory fails. I also notice that the story belongs to them all—any of the three men could have easily being the one telling the story. I put on this clothe but only for a moment—history is not a private attire. There is no refuge without a collective truth. I think a lot about Oba Ovonramwen Nogbaisi—the fated king standing here, ready for exile, lifting his gaze one last time, beholding the water that had brought the white men to his doorsteps in the first place. But when I stand there today, on that edge of the water in Gele Gele, I think of nothing. Later when we interview one of the indigenes, we find that there has been a court case between them and the people of Benin for 30 years—a tussle for the possession of the land. This is when we understand why the chief had been mad. He had refused to believe that we were not spies from Benin. I imagine that he was tired of Gele Gele being merely a conduit of history—a clothe worn only out of necessity and hurriedly discarded. But history is only a culmination of contexts; the past is always straddling the present. I was with you on these days but your recollection of the events makes me want to relive them all over again. Brilliant Yinka. Very nice one Yinka. I like your transition and how u keept the metaphors to the minimum. Really sounded like the story more than the poem. I hope to read more from you.